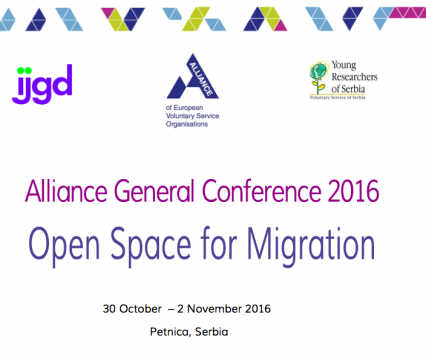 The Alliance General Conference "Open Space for Migration" took successfully place in Petnica (Serbia) from 30 October to 2 November 2016, with the support of IJGD Germany, as the coordinating organization, and YRS-VSS Serbia, as the host. It was financed by the German National Agency through ERASMUS+ PROGRAMME of the European Union. The event focused on the refugees humanitarian crisis, particularly in Europe, and to exploring a response of International Voluntary Service (IVS) to it, from different perspectives. The event was also an opportunity to evaluate the IVS activities carried out within and outside Alliance organisations on the migration topic during 2015 and 2016, and to discuss about how to proceed in the future. The outcomes of the General Conference, available here for download, include a critical assessment of the role if IVS in the current situation and a list of project recipes already implemented by Alliance member organisations at national and international level to support refugees and hosting communities. The General Conference (GC) of the Alliance of European Voluntary Service Organisations usually takes place every two years and responds to the needs of the members organisations to discuss, map the current situation around Europe and beyond, share good practices and form conclusions and recommendations about a specific topic. The recommendations are then brought to the General Assembly, which takes place right after the conference, for inclusion in the decision-making process about the network's priorities and future Plan of Action.